Oppos, How do you keep your head when searching for a new toy? What I really, really want. What I get may have more “patina”. So I’m on the hunt for a summer DD/project truck. What do I want? Good question. 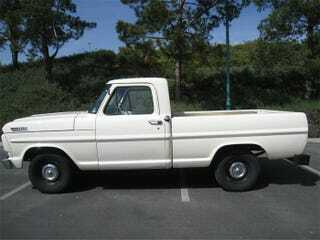 I want a 1967-1972 SWB Ford F100. I think. A LWB model wouldn’t be rejected if it looks right. This is where the Automotive ADD kicks in. If I come across a 60-66 “Slick” at a reasonable price I’d be on board with the program too. Hey! That 69 C-10 looks pretty nice! Ooh look, a Jeep J10! Is that a 1979 F150 Pace Truck? I’m losing my freaking mind! How do you stay focused on one vehicle?